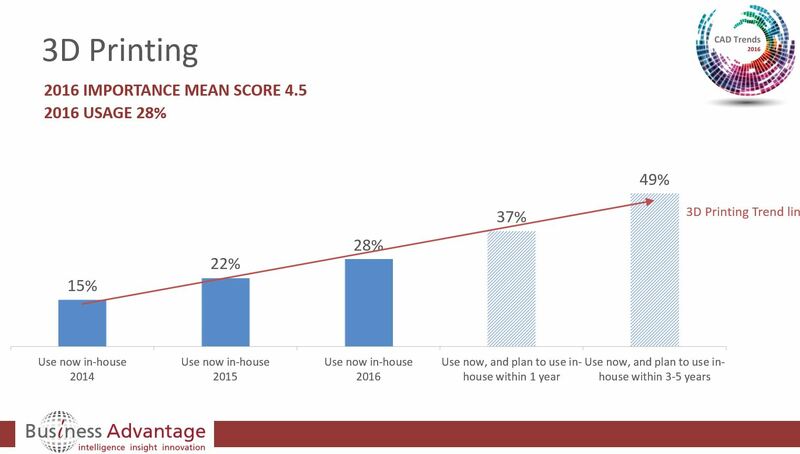 Usage has increased significantly, but importance remains below average compared to other trends studied which indicates a growing niche for 3D printing in today’s market. There is significantly lower usage in AEC (10%) than all other industry sectors such as manufacturing (37%), lower usage in APAC (24%) than in EMEA (28%) and Americas (30%) and in small companies (19%) than medium (31%) or large (32%). Growth is predicted in all sectors and regions. Across sectors it varies widely, for example, growth this year in manufacturing (excluding process and plants) is expected to be 27% (from 41% to 52% usage) but in AEC (excluding utilities) it is expected to grow 89% though from a much lower base (from 9% to 17% usage). Within 5 years usage is expected to be 65% in Manufacturing and 31% in AEC. Across all sectors current usage is highest in Education (69%) and Manufacturing (ex. process and plants) (41%) however usage in AEC, Utilities and Process and Plant industries are currently in the 9%-23% range. This survey is just of CAD users, so it is only predicting growth related to that audience. 3D Printing has other applications such as additive manufacturing and overall growth in 3D Printing is likely to be even higher than this survey is predicting. Perhaps less encouraging for 3D Printer manufacturers is low brand recognition amongst CAD users with almost half (49%) being unable to name the brand they use. Of those that could name their brand, 1 in 4 (25%) use Stratasys, 1 in 6 (16%) use Makerbot, 1 in 10 (9%) use Objet, 3D Systems and Cubify. Based on those CAD users already using or planning to use 3D printing the main benefits are seen as design improvements (59%), savings in design time (51%) and costs (30%), as well as faster response times to market (43%); confirming that product designers in particular have much to gain from 3D printing. The ability to 3D print low-cost physical prototypes early and locally is speeding up the design process by enabling tangible design checking and improvement of form, function and fit as well as testing customer reaction with fast iterations. Naturally the report is a high level summary of insights gained from the data gathered and this series of blog posts enables us to add further detail but if you are interested in still more detail, such as information on the 3D Printing trend by region, industry or software vendor, give us a call to chat with a research executive about your needs.